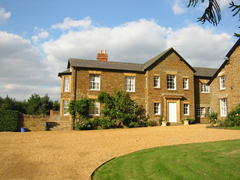 Bed and Breakfasts near Northampton Saints Franklins Gardens for 1 night from Thu Apr 25, 2019 to Fri Apr 26, 2019 within 25 miles, in an Average Nightly price range of £1 to £200. Murcott Mill is a wonderful Georgian Mill house close to a tributary of the Nene River. The house has been in the family of the owners since it was originally built to mill grain in 1760. Guests will receive a very warm welcome and can relax and enjoy the tranquility of the countryside whilst being very close to the village of Long Buckby. br / br / Northamptonshire is a county with a wealth of historical interest country houses and fabulous gardens open to the public and Murcott Mill is ideally situated to visit Althorp Cottesbrooke Hall Coton Manor Gardens. There are great places to fish horse ride play golf and sail in the area. There are lovely country walks from the house and the Grand Union Canal is within walking distance. br / br / br / br / There is a delightful sitting room for visitors whilst staying with an open log fire. On warm days guests can sit in the garden enjoying the country air and beautiful views. There is a separate dining room where a delicious breakfast is served. All bedrooms are very comfortable and have a flat screen tv dvd freeview clockradio internet access and tea and coffee making facilities. br / br / br / br / There is plenty of off-road parking. Well behaved pets are welcome. The Crown provides accommodation with a garden and free WiFi, and is set in West Haddon. Leicester is 41 km from the bed and breakfast. Birmingham Airport is 57 km away. The Crown Inn is located in the quaint village of west Haddon and perfectly placed for discovering the beautiful Northamptonshire countryside. It first opened it s doors to visitors in 1717 and continues to offer a traditional welcome comfortable accommodation and a hearty breakfast for all it s guests. The 16th century three-storey listed building still to this day remains at the heart of the village and community. br / br / br / br / Within easy reach of Daventry Rugby and Northampton and just 10 minutes from junction 18 of the M1 it makes the perfect base for business a short break or weekends away. Cold Ashby Golf course is a few minutes drive away as well as Althorpe Holdenby House Stanford Hall and other attractions such as Crick Boat Show. We are also within reasonable driving distance of Silverstone race course Towcester and Warwick races and Rockingham speedway. br / br / br / br / All the guest rooms have been refurbished as well as bar and communal areas. The Crown prides itself on making it s guests feel at home in clean and comfortable surroundings. There are flexible room rates available with breakfast or on a room-only basis. br / br / br / br / Pets are welcome as long as our guidelines are followed. br / br / br / br / Please take note of our standard opening hours - from 4pm weekdays and 12 noon weekends. If you need to check in before this then please let us know.